Call For An Introductory Demonstration. Food Connex helps you easily manage catch weights, broken cases, customer specifications and traceability. Food Connex easily manages orders. A single customizable screen displays historical orders, current inventory and pricing ― helping you to recommend and upsell product. Food Connex provides you with on-demand access to inventory so you can immediately answer customers’ questions – and deliver best-in-class service while making the sale. With a quick and easy QuickBooks integration, Food Connex can help you manage pricing and profitability, while eliminating the hassle of multiple stand-alone systems. Looking to Fulfill Orders and Generate Invoices Faster? Introducing Food Connex’s new Mobile Fill-n-Ship capability. 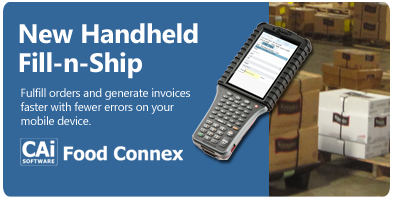 Food Connex’s Fill-n-Ship is for any mobile device and can improve productivity, minimize errors, and reduce labor costs with a simple and friendly interface that lets you sort orders and view up-to-date route and completion status. To learn more, call (833) foodconnex or email . The Common MarketWe’ve experienced dramatic growth over the last seven years and our food safety, traceability, and documentation needs have grown with us. Tampa Steak CompanyFood Connex have really helped out with the pricing, it can now be quickly updated based on the new costs. Indian Ridge ProvisionsWe’ve eliminated 75% of all the credits we had to give by getting the invoices out the door accurately! Camellia FoodsI stopped having to spend time every day answering questions and internally supporting the old system. The Food Connex team has over 75 years’ experience in the food distribution business and can be a trusted, proven business partner.